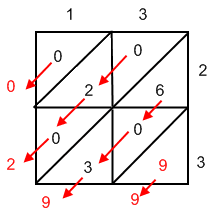 The box multiplication technique is suitable for people that has problem with numbers, since it will organized all the number in place. 13 × 23 = 299 First, draw a box for each number. Divide each box diagonally, with a straight line. Then multiply diagonally to the right. For example, 3 × 2 = 6. Put 0 inside the left triangle and 6 inside the right triangle, and so on. After we have fill in all the numbers inside the triangle, add all the numbers diagonally to the left. For example 6 + 0 + 3 = 9, 0 + 2 + 0 = 2. Write the addition at the end. Follow the arrow. 79 × 85 = 6715 In this example, when we add 2, 4 and 5, we get 11. So, we write 1 and carry 1 (just write it in bracket). Next, when we want to add 7, 6 and 3, add the carry number as well. So, it will become 7 + 6 + 3 + 1 = 17. The same thing goes here. Write 7 and carry 1. 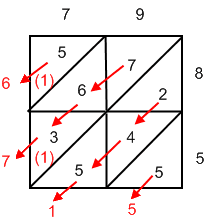 The last one is 5 + 1 = 6.
note: The box multiplication technique could also be applied to the numbers that are more than two digits, such as 234 × 346 and 342 × 34.